A donation to Farm Sanctuary is the perfect way to honor someone special in your life, while supporting the rescue and lifelong care of thousands of farm animals, our targeted advocacy campaigns, and our year-round education work. A gift in memory of a relative, friend, or co-worker who loved animals provides a special way to memorialize his or her compassion and devotion to our animal friends. A memorial gift to Farm Sanctuary leaves a legacy of compassion by enabling the rescue and lifelong care of thousands of abused farm animals, and our efforts to reform the factory farming industry. Click here to make a gift in memory of a beloved animal companion. Farm Sanctuary is pleased to acknowledge gifts of $35 or more with a special card to your gift recipient and a letter to the gift giver. Or send a card with a personalized message for $50. 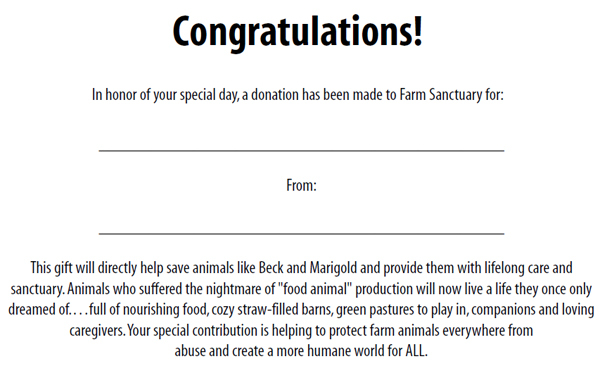 A donation to Farm Sanctuary is a great way to commemorate special occasions, such as birthdays, graduations, engagements, weddings, anniversaries, and Valentine's Day. Name: Please enter gift giver's name. Please send card to me to give to the gift recipient. Yes, I would like to receive email communications from Farm Sanctuary. Check this box if you want this site to remember you when you return. * Bank Routing Number: Required Bank routing number is required. What is this? * Bank Account Number: Required Bank account number is required. * Verify Bank Account Number: Required Bank account number is required. Required Bank account withdrawal confirmation is required. If you would prefer to send your payment by mail, please print this page and send it to FARM SANCTUARY P.O. BOX 150 WATKINS GLEN, NY 14891. Checks and money orders should be made payable to Farm Sanctuary. •	Call the Watkins Glen, NY office at 607-583-2225 ext. 221. All major credit cards accepted. 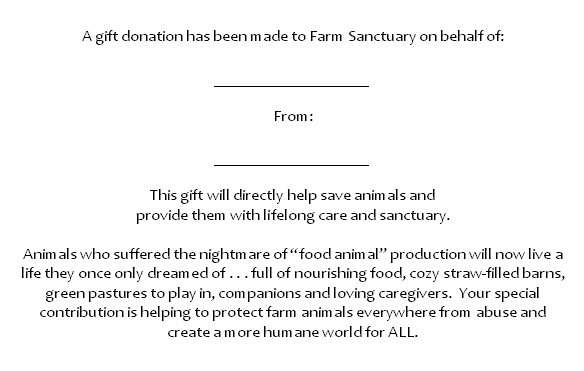 Farm Sanctuary, Inc. is registered as a 501(c)(3) non-profit organization. Contributions to Farm Sanctuary are tax-deductible to the extent permitted by law. Farm Sanctuary’s tax identification number is 51-0292919. For additional information, including our financial statements and state-specific disclosures, please visit https://www.farmsanctuary.org/about-us/financial-statements/.